If you read my last post about Mughlai chicken curry I think you will agree that was a pretty nice main course. 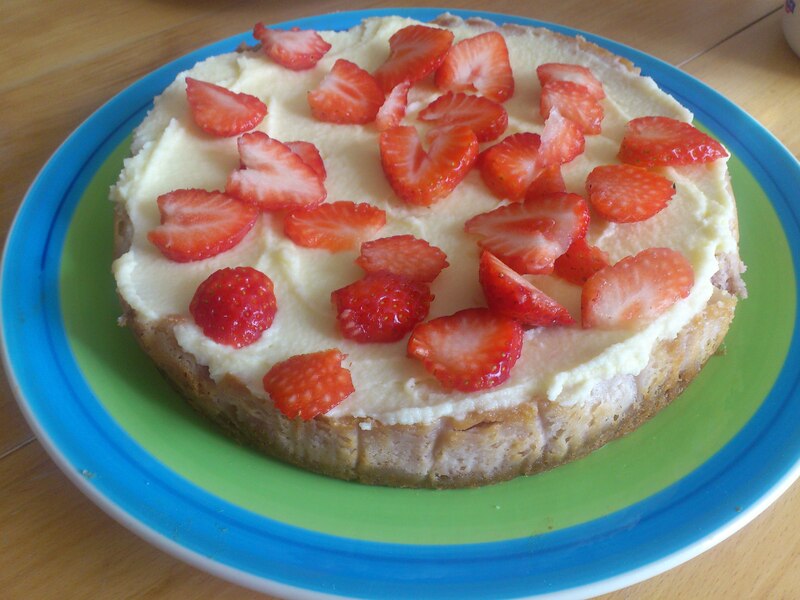 This is strawberries and cream cheesecake is the king of desserts! I first fell in love with the cheesecake way back as a little boy. I remember trying my first slice when we went to a pub restaurant in Wheathampstead. I don’t think I could have been much older than eight or nine years old. My grandparents had taken me and my brother our for a nice meal and this pub, The Bull, was the usual place to go. No matter what the occasion we always went to celebrate it at The Bull. My grandparents knew the couple who ran it and most of the staff. We went quite often from when I was young through my teenage years and the staff there watched me grow up. Though I have grown up and moved away to London now I still go back there for Christmas dinner with my grandma and I still see some of the same people working at The Bull behind the bar. I still love the cheesecake they serve there and now I know that it could have been made by my brother who is one of the chefs in the kitchen. This cheesecake recipe was chosen and cooked by the lovely Hana from our copy of the Hummingbird Bakery cookbook, Cake days. It is a really good book and anyone who has followed this blog will know I have baked quite a few things from it since Hana bought our copy. 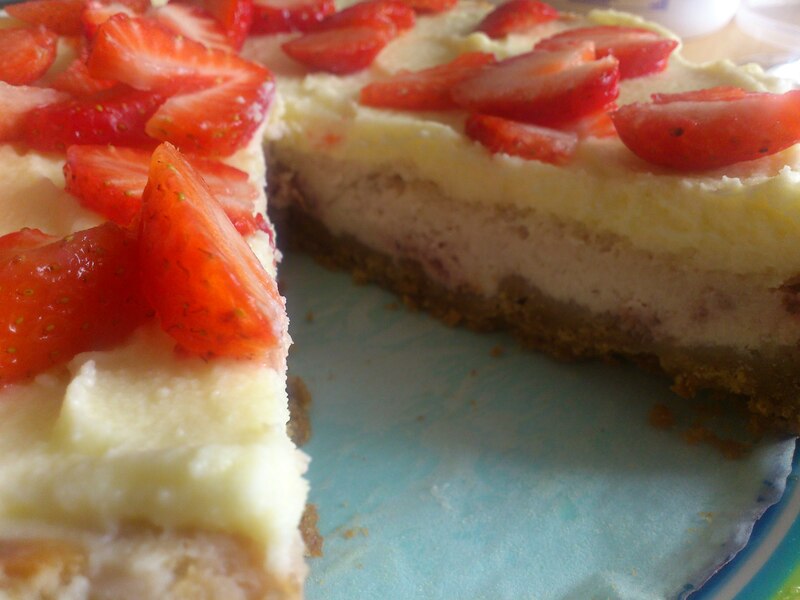 I think this is a really good cheesecake recipe, Strawberries and cream, Yum! It tastes quite light and fresh with strawberries mixed in the cheese filling. This is a baked cheesecake and the recipe recommends that when you bake it you do so in a bain marie. You can make this using a roasting tin with water in which you lower the cake tin into. The bain marie should stop the cheesecake drying out. We didn’t have a roasting tin large enough so we baked it by itself and it still came out okay. I would recommend following the recipe just in case, its best to make it the night before and chill over night in the fridge if you have time. a 20cm/ 8in diameter spring-form cake tin, or as we used a normal cake tin. Line the base of the tin with baking paper and preheat the oven to 160c/320f/gas 3. Add the digestive biscuits to a blender or food processor and blitz to a fine crumb. Pour the crumbs into a bowl. Gently melt the butter in a pan then add it to the crumbs. 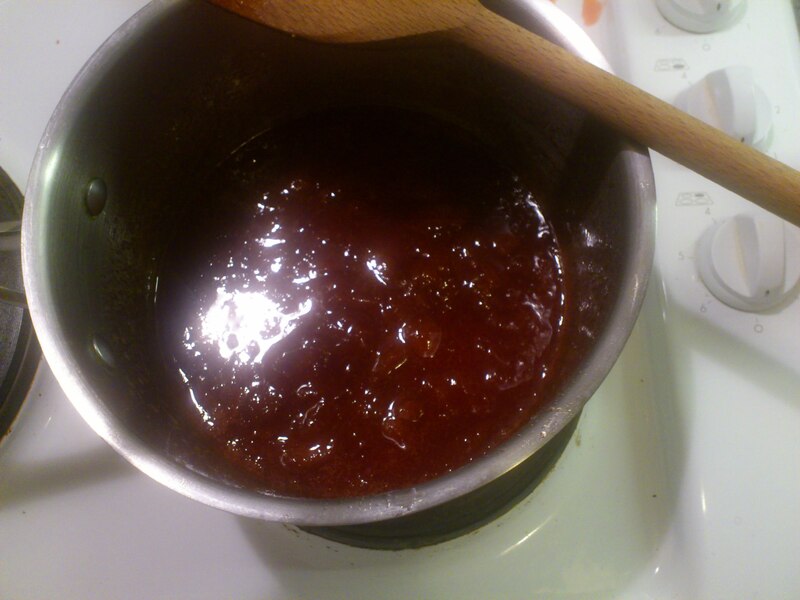 Stir them together and press the base into the cake tin using the back of a spoon to smooth it down. Pop it in the fridge for 20-30 minutes to set. Grab your blender again and this time add the cream cheese and the remaining sugar. Beat to a smooth mix before adding the eggs one at a time. Mix till everything is combined and you have a smooth mixture. Tip in the cooled strawberry mix and stir by hand. Take the base out of the fridge and pour in your cheesecake filling, it should be roughly 2/3full. Place the cake tin in a roasting pan and fill with 1/4in of water. Bake in the center of the oven for 30 until the top if firm but with a little bit of wobble in the middle. Cool the cheesecake on a wire rack then pop it in the fridge to set, about 2 hrs. When the cheesecake is set its time to make the creamy topping. Beat the mascarpone and icing sugar on a medium speed till smooth. Whip the double cream separately then fold into the mascarpone/ icing sugar. Spread this evenly over the cheesecake. Pop it back in the fridge for a couple of hours or if you have time do it over night. when you are ready to serve, sprinkle the reserved strawberry halves over the creamy topping.